When it comes to the tablet market, there’s the iPad and there’s everybody else. Apple dominates the market, especially in the premium price range. To hold on to its position, Apple has been kept things fresh with new models like the 12.9-inch iPad Pro and new technologies like Apple Pencil and ProMotion. But the fundamental design of the iPad hasn’t changed much in years. That could all change in 2018, as Apple gives use the first holistic new iPad design in a very long time. Updated 10/9/18: 9to5Mac reports on details of the upcoming iPad Pro. 9to5Mac cites “sources familiar” with the new iPad Pro in a report on Monday. The site has details on an upcoming iPad announcement that has been widely speculated to happen this fall. The most intriguing part of the report is that Apple could be implementing two new connectors. The first is called the Magnetic Connector, which seems as though it will replace the Smart Connector that’s currently used to attach accessories such as a keyboard. The Magentic Connector could be located on the back of the new iPad Pro. The second connector is a USB-C port, which will have support for 4K HDR video output for an external display. This feature will also have new software controls in iOS. Though the 9to5Mac report doesn’t specifically say that USB-C will replace Lightning, this report follows with past reports of USB-C implementation. The 9to5Mac report has other details that have been part of the iPad Pro rumor mill for months: a new Apple Pencil (that pairs with the iPad in a similar fashion as the Apple AirPods), landscape Face ID, and an edge-to-edge display without a Home button. Plausible? At this point in the year, we’re hearing a lot of the same rumors being repeated, which makes the rumors sound more possible. In a rumor from September, we thought that there was a possibility that the USB-C rumor was a misunderstanding, but now the details of external display support seem to imply that Lightning will be replaced. The new iPad Pro that’s expected to be released later this year is rumored to have Face ID support. But will Face ID will work when using the tablet in a landscape orientation? According to the beta of iOS 12.1 released to developers on Tuesday, the answer is yes—but only with the yet-to-be-revealed new iPad Pro. Developer Steven Troughton-Smith, who’s known for digging into the code of Apple’s OS releases, discovered what looks like code for landscape Face ID for the upcoming iPad Pro. He made the following tweet about his findings. 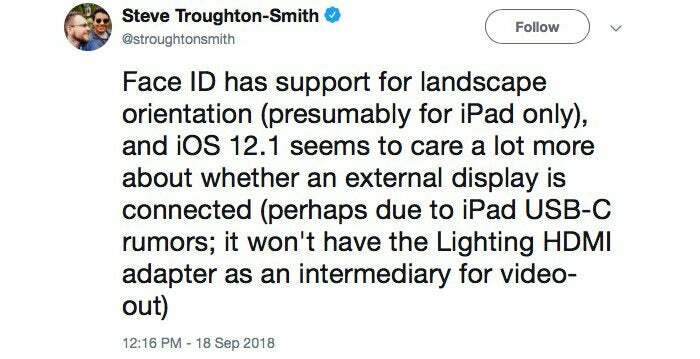 Troughton-Smith also tweeted that “Face ID would require a realignment of the front-facing sensors,” which means the feature will work only on new iPads, and not of existing iOS devices. Plausible? Troughton-Smith saw this in the iOS 12.1 beta code itself, so it’s at least a feature Apple is working on. Considering that the iPad Pro is often used by professionals in landscape orientation, it seems like Apple is going to do what it can to accommodate those users. This rumor was reported on September 10, 2018. Plausible? It’s a little confusing. It certainly reads as though the iPad Pro will have a USB-C port on it instead of a Lightning port, but it could be a case of misunderstanding. The “removable plug design” is likely in reference to the power plug (which is removable and swappable in the current 12W iPad power adapter, as in the MacBook power adapters) and not the USB side. Previous leaks and rumors of the 18W USB-C power adapter presumed to be bundled with the new iPhones show a single unit with integrated plugs, but a USB-C port for a USB-C to Lightning cable. It’s hard to imagine that Apple would replace Lightning with USB-C on any iOS devices just yet, and particularly not the iPad Pro, which charges up the Apple Pencil by plugging it directly into the Lightning port. This rumor was reported on August 03, 2018. In iOS 12 beta 5, an “asset mask” (a tool for developers to make sure that interface elements fit on screen properly) has been discovered that shows rounded corners on what should be this year’s new iPad Pro. 9to5Mac discovered the image, named “J3xx affordance corners.png”, where J3xx would refer to the model numbers of upcoming 2018 iPads. They found the asset by running a modified device ID in the iOS simulator, so it’s possible some things may not be formatted exactly as it would with real hardware, and of course everything is subject to change. This asset mask shows an iPad (in multitasking split view) with rounded display corners. Plausible? Yes, this is almost a given. We fully expect this year’s iPad Pro models to feature thinner bezels that are symmetrical all the way around, with rounded display corners; like an iPhone X without the notch (the bezels will probably not be as thin as the iPhone X, leaving enough room for the TrueDepth camera module). It’s nice to see hints of this in Apple’s official iOS beta releases, but it’s not at all unexpected. This rumor was reported on July 30, 2018. Japanese blog Macotakara reports some new rumors from its contacts in the Apple supply chain. It corroborates what we’ve heard before: that the Touch ID sensor would be eliminated in favor of the Truedepth sensor array for Face ID, and that the bezels would shrink a lot. It adds that the headphone jack would be removed (which we haven’t heard but suspected anyway. 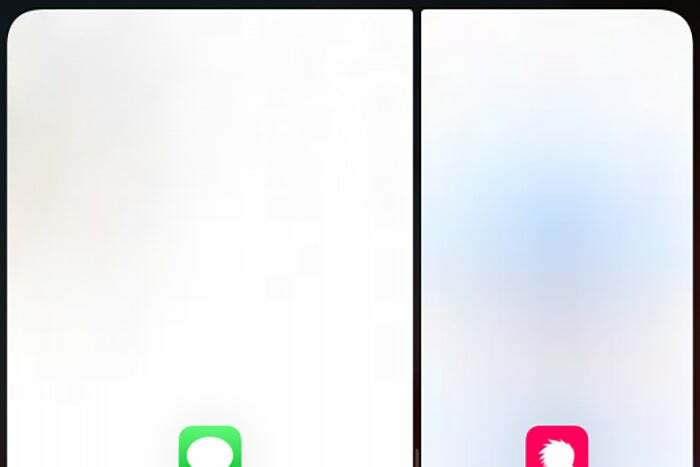 It then claims that Apple has not been able to make Face ID work well in landscape mode, and so not only will the iPad need to be in portrait orientation to be unlocked, but the Smart Connector will be moved from the side edge to the bottom edge. You would dock the new iPad Pro into a Smart Keyboard in portrait orientation. The rumor is somewhat corroborated in a tweet by OnLeaks, showing a mysterious spot on the back of the iPad in a purported iPad Pro CAD drawing. Even OnLeaks says it “can’t confirm the accuracy” of this CAD image. Plausible? We think the headphone jack thing is probably true, but moving the Smart Connector to the bottom edge is bonkers. We lay out our reasoning in a separate article. Essentially, Apple hasn’t spent the last two years telling everyone the iPad Pro is a computer replacement only to make landscape use (arguably it’s primary orientation!) second-class. What’s more, this purported connector on the back of the iPad would be poorly suited for a Smart Keyboard—they keyboard would need to wrap around to the back of your iPad. We feel it’s more likely that the traditional Smart Connector still exists on the side of the device, for Smart Keyboards, and that this thing (if it even exists) is some sort of new connector. Perhaps a magnetic charging spot for the Apple Pencil, or for third-party accessories? This rumor was reported on June 11, 2018. Ming-Chi Kuo, an analyst whose contacts throughout the Apple supply chain have made him uncommonly accurate with future product predictions, has a new report out for TF International Securities. Among other things, it claims that Apple is working on a pair of new iPad Pro models. The new iPad Pro models are said to have a design more like the iPhone X, with thin bezels all around and Face ID in place of a Home button. That doesn’t necessarily mean they’ll have a taller aspect ratio, of course, as iPads have long enjoyed a more page-like aspect than iPhones. One is said to be an 11-inch model, which would be a half-inch larger than the current 10.5-inch version, and the other is hanging on at 12.9 inches. Kuo says the new iPads should ship this fall. Plausible? Honestly, we’d be shocked if the next iPad Pros had a home button and no TrueDepth camera. Apple will need to make Face ID work in any orientation to realistically put it on an iPad, but that seems like a solvable problem. The sizes sound about right, too. Simply making the bezels slimmer on a 10.5-inch iPad would make the screen 11 inches without affecting the actual physical size much at all. The 12.9-inch iPad could maintain the same screen size with smaller physical dimensions by reducing screen size. We question what else the new iPads could bring. Perhaps an A11X processor? Or would they use the same A12 (or a variant of it) expected in this fall’s iPhones? This rumor was reported on March 23, 2018. Mark Gurman of Bloomberg reports that Apple will unveil a new entry-level iPad, with the idea that the device would appeal to the education market. The Bloomberg story does not offer any specifications or pricing. Plausible? Apple’s grip on the education market isn’t what it used to be. Google Chromebooks have become popular and have replaced Apple devices in many schools. Apple saw a boost in sales when it reduced the price of the 9.7-inch iPad last year to $329. An iPad under $300 could be a big winner for Apple and help it regain marketshare in education. This rumor was reported on March 7, 2018. According to a memo from analyst Jun Zhang of Rosenblatt Securities, a new iPad Pro with a TrueDepth sensor (and thus Face ID) is likely to be announced at the WWDC conference in June, and will ship later that month. The iPads will feature a new design with slimmer bezels and no home button, though we expect that, because of the way iPads are held, we can expect a bit more bezel than you find on the iPhone X. It is not yet known whether the new iPads would feature a “notch” or not, nor are the specs detailed in the memo. We expect the new iPads to feature a processor based on the A11 design, probably and eight-core “A11X.” The new iPads are not expected to use OLED displays, however. Plausible? The timing makes sense. The second generation of iPad Pro tablets were announced at WWDC last year, and Apple seems to have licked its production problems with the TrueDepth module. This rumor was reported on February 21, 2018. As first spotted by French site Consomac, the Eurasian Economic Commission has given approval to Apple to sell two new iPad models we’ve never seen before: A1893 and A1954. The EEC approves the sale of any products with encryption sold in Armenia, Belarus, Kazakhstan, Kyrgyzstan, and Russia. We can’t glean too much from the model numbers themselves—the “A” model numbers cannot be directly translated into any particular feature or specification. But iPads of the same size and generation typically only differ in the last two numbers, meaning that A1893 and A1954 are probably different sizes, not just the Wi-Fi and Cellular versions of the same iPad. Plausible? Apple often holds an event in March to announce new hardware, but it doesn’t do so every year. iPads often feature as part of that announcement. The timing of this certification suggests that Apple will hold a March event again this year and announce two iPads, though that does not preclude the company from also releasing an iPad or two later in the year. The regular lower-cost 9.7-inch iPad may get an annual refresh, and the iPad Mini is long overdue for an update. Apple is also said to be preparing a new high-end iPad with slim bezels and a TrueDepth camera module, though our guess would be that such a product would be announced later in the year. This rumor was reported on February 12, 2018. While we already heard a rumor that the next round of iPads would support Face ID for unlocking, a report on iOS 12 in Bloomberg contains some some confirmation that Apple’s tablet will be adopting the iPhone X’s unique camera. Mark Gurman reports that Apple is working on a new iPad “that will have the required Face ID camera” to handle Animoji. The precise language here makes it unclear whether the camera will be exactly the same as the one in iPhone X, but the report makes it clear that will have the depth-sensing abilities required for Face ID. Additionally, Gurman reports on a new iOS feature that could be making its way to the iPad soon: tabbed apps. Similar to the feature on macOS, it would allow users to open multiple windows within an app and navigate between them, much like how it’s done using Safari. He says the feature was originally planned for iOS 12’s launch in the fall but may have to wait until 2019. Plausible? Apple generally debuts major features in the iPhone before bringing them to other products in its lineup, so it’s expected that the TrueDepth camera will make its way to the iPad sooner rather than later. It would be somewhat of a surprise for the tablet to pick it up before the entire iPhone line does, but this rumor is still very believable. However, we don’t expect the iPad to adopt an iPhone X-like notch anytime soon. A sub-$300 9.7-inch iPad in the works?